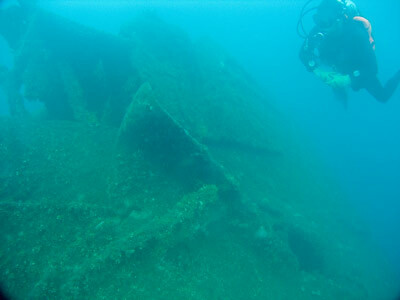 Michael McFadyen's Scuba Diving - Tokai Maru The keel of the Tokai Maru was laid down on 26 November 1929 in the Nagasaki Zoensho shipyard of Mitsubishi Zoen K.K. The ship was the second of six class diesel powered Kinai cargo ships being built for Osaka Shosen K.K. of Osaka, Japan. The new ship was launched on 15 May 1930. She was completed on 14 July 1930 and registered at Osaka. 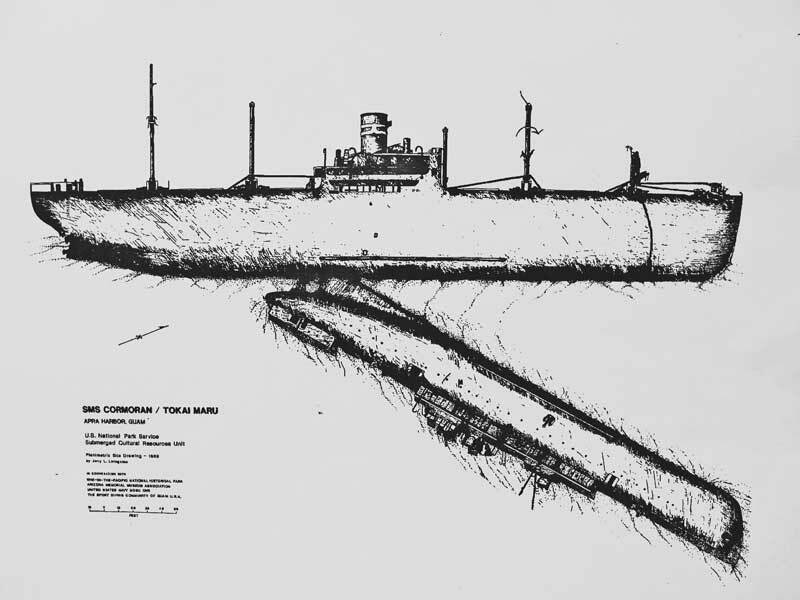 The Tokai Maru was 139 metres long, 18 metres wide and had a gross tonnage of 8,365 tons and a net registered tonnage of 5,046 tons. She was powered by two Sulzer 8,262 hp diesel engines turning twin props. She had a cruising speed of 16 knots and a maximum speed of 18.4 knots. The Tokai Maru was put into service on the Kobe to New York route, operating via the Panama Canal. It was a very circuitous route, as she travelled (not all ports listed) Philippines, Hong Kong, Formosa (Taiwan), Shanghai, Kobe, Yokohama, Los Angeles, Columbia, Panama and New York. On the return she did almost the same trip, missing Columbia and some other ports I have not mentioned. On 20 August 1933 the Tokai Maru ran aground in Kirun harbour's entrance, just off the lighthouse. Kirun was in Formosa, and is now called Keelung, Taiwan. The hull was cracked and she took on water. The next day she freed herself. On 10 July 1938 she was placed on the European Lines Kobe to New York route. I am not sure what this means. In July 1941 the USA closed the Panama Canal to all Japanese ships due to Japan's occupation of French Indochina (now Vietnam). On 15 July 1941 the Tokai Maru departed Panama and travelled down the eastern coastline of South America and then via Magellan Strait into the Pacific Ocean. On 9 September 1941 she arrived back in Japan. On 12 October 1941 the Tokai Maru was requisitioned by the Imperial Japanese Navy as a transport (Ippan Choyosen). On 20 October 1941 she arrived in Kobe and the next day departs for Yokosuka and Shibaura, Tokyo. On 8 November 1941 the Tokai Maru departed Tokyo for Truk Lagoon (now Chuuk Lagoon), arriving there on 14 November 1941 (by coincidence, 70 years to the day I am writing this). On 4 December 1941 she left for Ponape (now Pohnpei) and arrived there the next day. On 2 January 1942 the Tokai Maru left Ponape and travelled to Rota, Marianas, arriving on 5 January 1942. On 9 January 1942 she left Rota and headed back to Japan, arriving in Tokyo on 14 January 1942. Later in January 1942 she travelled to Yokosuka and on 25 January 1942 she left for Kwajalein Lagoon, the Marshall Islands. She arrived at Kwajalein on 1 February 1942. On 10 February 1942 she left for Wotje Atoll, also in the Marshalls. She arrived there the next day. On 16 February 1942 the Tokai Maru left Wotje and travlled to Taroa Island, also in the Marshalls. This was the site of a Japanese airfield, in fact, the eastern-most airfield that Japan had during World War 2. On 22 February 1942 she departed Taroa and arrived the same day at Majuro Atoll, again, also in the Marshalls. On 25 February 1942 the Tokai Maru departed Majuro and arrived the same day at Jaluit Atoll, Marshalls. On 1 March 1942 she departed Jaluit and travelling via Ponape, arrived back in Japan on 20 March 1942. The Tokai Maru spent the next month in Japan and then on 2 April departed Sasebo for Davao, Mindanao in the Philippines. She arrived there on 7 April 1942. The next day she left for Surabaya, Java (now Indonesia), arriving there on 13 April 1942. Meanwhile, on 10 April 1942 the Tokai Maru was registered as an auxiliary transport and attached to the Kure Naval District in the Otsu category. Departing Surabaya on 22 April 1942, she travelled back to Davao arriving 27 April 1942. On 30 April 1942 she left for Hongay, Indochina (now Hong Gay, Vietnam), arriving 6 May 1942. It is believed coal was loaded at this port. On 8 May 1942 she left and arrived the same day at Port Campha (Cam Pha, Vietnam), also a coal port. On 12 May 1942 the Tokai Maru headed back to Japan, arriving at Fushika on 20 May 1942 and then Shibaura on 30 May 1942. She may have travelled via some other Japanese ports. On 6 June 1942 she departed Yokosuka for Truk, arriving there on 12 June 1942. From here she left 28 June 1942 for Angaur Island, Palau, arriving there on 1 July 1942. This was later the site of an American airfield. Over the coming week she went to Palau (presumably Koror) and back again before retuning to Japan. On 13 July 1942 the Tokai Maru arrived back in Kobe. Here she was converted to a military role, presumably by the addition of gun platforms and guns. Two 12 cm guns were added, one at the bow and the other at the stern. Four anti-aircraft guns were also installed, two twin 25 mm and two single 25 mm guns. On 1 August 1942 the conversion was complete and she departed for Miike, arriving there 3 August 1942. The next day she left for Tokuyama, arriving there 5 August 1942. She probably replenished her fuel tanks and then on 8 August 1942 the Tokai Maru departed for Osaka. Arriving the next day, she departed Osaka on 12 August 1942 for Takao, Formosa. This is now called Kaohsiung, Taiwan. She arrived here on 16 August 1942, departing for Singapore on 19 August 1942. The Tokai Maru arrived in Singapore on 24 August 1942 and departed two days later for Saigon (now Ho Chi Minh City). On 28 August 1942 she arrived in Saigon. On 6 September 1942 the Tokai Maru departed for Takao arriving 10 September 1942. Three days later she departed for Osaka in a convoy (261). She arrived in Osaka on 17 September 1942. On 27 September 1942 she left for Maizuru, arriving there on 29 September 1942. On 2 October 1942 she left for Gensan, Chosen (now Wonsan, North Korea). The next day she arrived in Gensan. She departed the next day and returned to Japan. On 6 October 1942 she departed for Moji again, this time probably in convoy 172. She arrived there on 9 October 1942. From here she travelled on 13 October 1942 to Haiphong, Indochina (Hai Phong, Vietnam), arriving there on 16 October 1942. On 23 October 1942 the Tokai Maru departed for Port Campha, arriving the next day (presumably again collecting coal at these ports). She left 28 October 1942 and travelling via Takao and Mako (Pescadores, Formosa/Taiwan), arrived in Convoy 286 at Osaka on 9 November 1942. On 16 November 1942 the Tokai Maru departed Osaka, arriving the same day in Kobe. For the next month she made numerous journeys within Japan. From 9 to 25 December 1942 the Tokai Maru was at the Kobe shipyard for maintenance and repairs. On 26 December 1942 she departed Kobe for Tokyo, arriving there the next day. On 31 December 1942 she left for Yokohama. From there she travelled via Yokosuka (departing 11 January 1943) for Saipan in convoy with Heiyo Maru, arriving there on 16 January 1943. 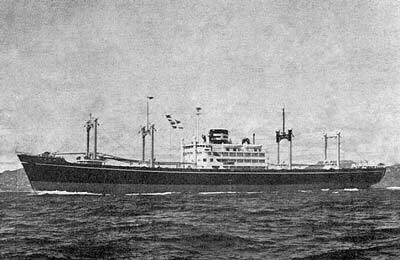 The Heiyo Maru continued on to Truk but was torpedoed and sunk the next day with the loss of 900+ passengers, 44 crew and over 4,000 tons of cargo. On 21 January 1943 the Tokai Maru departed Saipan to travel to Guam. She was to unload some cargo there before travelling to Truk where the rest of the cargo was to be unloaded. She was then to go to Palau to load bauxite. I am not sure when she arrived in Guam, but on 24 January 1943, the Tokai Maru was observed anchored in Apra Harbor, Guam, by the submarine USS Flying Fish. The skipper, Lieutenant Commander (later Vice Admiral) Glynn R. Donaho, assumed that the ship was soon to leave the harbour. He decided to wait outside the entrance for three days. There was no movement in or out of any vessels, so on 26 January 1943, the Flying Fish fired two torpedoes set to run at 15' depth (to cross over a very shallow reef). One torpedo struck the Tokai Maru causing considerable damage. It is reported that the other torpedo ran aground on the reef but some reports say it also struck the Tokai Maru. One crew member was killed. However, the Tokai Maru did not sink. She had a reported 40º list and at 1803 she went aground on the shallow bottom of the harbour, with her decks still above the water. During early February 1943 the cargo was transferred to the Shoei Maru. On 5 May 1943 it seems the Tokai Maru was still sitting on the bottom. The skipper of the submarine USS Permit, Lieutenant Commander (later Rear Admiral) Wreford G Chapple (died May 1991 aged 83 years) sighted the ship low in the water. He fired a number of torpedoes, one of which hit the ship, causing more damage. In early August 1943 the Tokai Maru was raised and obviously some repairs done so she could float. She was taken to the northern end of the harbour and attached to a mooring. 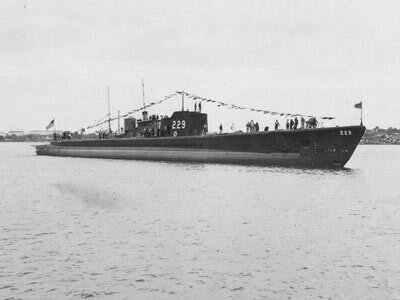 In August the submarine USS Snapper skippered by Lieutenant Commander (later Rear Admiral) Merrill K. Clementson, spotted two ships in the harbor. Not knowing at the time that these were the Tokai Maru and another damaged ship (Nichiyo Maru), the submarine waited for one week. On 27 August 1943 he made a submerged attack even though a Japanese patrol vessel was less than two miles away. At 3:23 on the afternoon of August 27th, the Snapper fired a spread of four torpedoes, three at the nearest ship (Tokai Maru) and the fourth at the other (Nichiyo Maru). Six minutes after firing the torpedoes they heard a faint explosion and using the periscope, they observed that the Tokai Maru was down by the stern and listing 10º to 15º to port. The stern was covered in a grey/black smoke. Seven minutes after the attack started another explosion was heard. Thirty seconds later it was seen that the Tokai Maru was now sinking. Another thirty seconds later the ship's stern was sitting on the harbour bottom. The water came up to amidships and the rear kingposts were half underwater. The Snapper departed Guam to patrol the Truk to Japan traffic lane. The Tokai Maru had been hit twice in the engine room on the port side. The crew abandoned ship after she developed a 40º list and started sinking by the stern. All crew were safely ashore by 15:40. At 19:03 the bow disappeared below the water's surface, pulling down the mooring buoy. Note: the times in the above few paragraphs are taken from the submarine's log. These vary by one hour from another report. I have altered the other times to match the times used by the submarine. When the Tokai Maru sank, fate would have it that she sank right next to the wreck of the SMS Cormoran, a German World War 1 wreck. Click here to read more about the Cormoran. 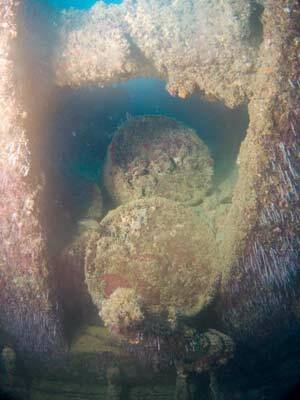 In fact, it may not have been fate, perhaps the mooring buoy used by the Tokai Maru was attached to the Cormoran. More about that in the article on the Cormoran. Note if you plan to dive both the wrecks, you should dive the Cormoran first as it is deeper. 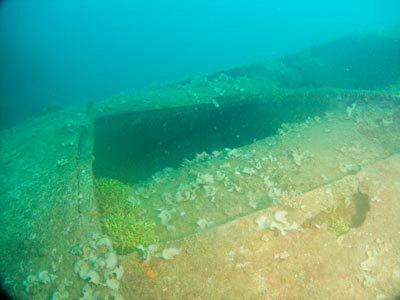 At some time, probably in the 1960s or 1970s, the propeller blades of the wreck were salvaged. This would have been a relatively easy job as the blades are a bolt-on type and can be taken off individually. When I dived the wreck in November 2011 the skipper of the charter boat we were using claimed that five US Navy personnel had died on it a couple of years before. However, after diving it and researching the internet, I do not believe this claim. I have had a couple of people email me, including some from Guam, confirming that this happened, but still no-one could come up with any first hand evidence. So far as I can see, if it did happen, it is at least 15 or 20 years ago (one source says he thinks it was mid-1990s). The story I was told was that they were inside (probably only 4 of them) and an earthquake stirred up the silt in the engine room to cause a black out. Three of them got out but then they went back in to find the other one, and they all died. Another death was said to be a Navy officer in a separate case. In June 2014 I was emailed a couple of times by Cole Herndon who sent me a few links to US newspaper archives which had information about the accidents. As I suspected, the first one happened a long time ago, back in 1994. The details as far as I have been able to work out are as follows. On the night of Friday 5 March 1994 at least three divers went for a midnight dive on the Tokai Maru (some reports state 4 March 1994 but I suspect this was US time). They were Christopher E. Horton (23) of Antioch, Illinois, Charles Patten (28) of Ozark, Missouri and Robert Guimond (26) of Massachusetts (but probably living in Amarillo, Texas before moving to Guam). All were members of the US Navy based on Guam. A report by the Navy into the accident (released in October 1994) stated that a 5.1 earthquake happened while they were inside the wreck. 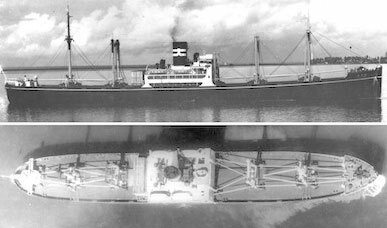 The report stated that this was believed to have stirred up the silt inside the wreck and that Horton and Guimond were able to successfully exit the wreck and surface. However, they descended again and went back to look for Patten and all three then were lost. Their bodies were recovered the next day, Saturday 6 March 1994. 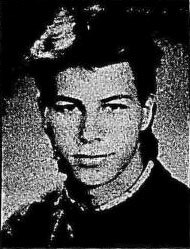 It is possible that the other incident happened about 1994 as well as an article in the July 2005 issue of Faceplate (newsletter of the divers and salvors of US Navy) appears to be about a Navy officer dying while on a dive on a wreck in Guam over 10 years previously. This article (see references) says that he had little sleep over the preceding 30 hours, perhaps as little as four hours. The officer had not dived for eight months and then proceeded to dive to 120 feet (36 metres) on a requalification dive. 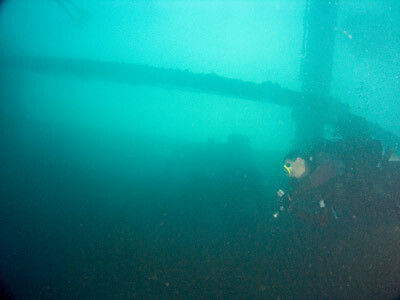 In the early afternoon, the officer and another diver descended on the wreck. They only did a four minute bottom time (why so short?) before ascending. The ascent rate was said to be less than 30 feet (9 metres) per minute. Once back at the boat, the officer had difficulty getting into the boat, and once aboard, he slipped to one knee. His chin sank to his neck, all the time the officer was telling the supervisor he was okay. The supervisor decided that he was suffering an arterial gas embolism (AGE). The officer was put on oxygen and transported to the Navy recompression chamber. Within 18 minutes he was inside and taken down. He reported tingling and decreased sensation. After several hours this worsened. He was kept in the chamber for 49 hours, but in the end he got a lot worse and it was decided he had to be brought back to the surface for attention. He was taken to Intensive Care Unit and 10 days after the dive, he died. It is not known what caused the AGE. Anyway, for the most part, the wreck is open and easy to access and I really fail to see how anyone but a complete idiot could get lost inside the wreck without some extraordinary event like an earthquake upsetting the norm. The operator also claimed that the visibility would be terrible, less than 10 feet (three metres). It was more like 10 to 12 metres and from discussions with other Australians who have dived the wreck, this seems to be normal. Today the Tokai Maru lies at a GPS Reading of N13º 27.342' E144º 39.233' using WGS84 as a datum. This is about one third of the way from the inner harbour of Apra Harbor to the open ocean. There is a mooring buoy here, close to the red port channel marker. The mooring is attached to the rear of the bridge superstructure. 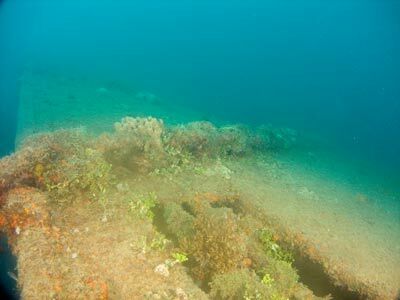 When the ship sank, it turned almost totally on her port side and now rests in just under 40 metres of water. 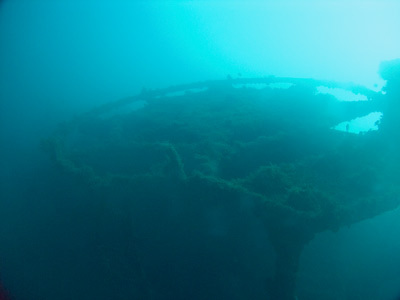 It is quite a large wreck, although one dive would give you a good understanding of the wreck. Remember, it has no cargo as it was emptied after it was sunk the first time. 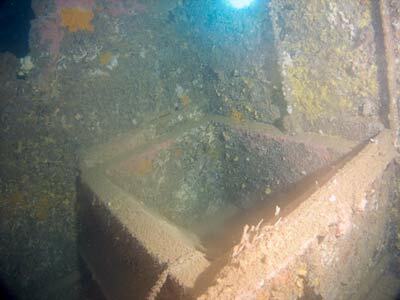 After descending to the bridge, you will see that the wreck is angled at perhaps 50 to 60º to port. Swim along the starboard railing towards the stern (that is, have the hull on your left and the deck on your right). 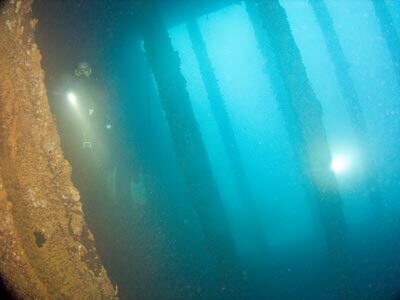 After a few minutes you will come to the propeller shaft. The shaft sticks out of the flared propeller shroud about two metres. You can see where the blades were bolted on to the shaft. From here, head around the bow. The poop deck is the first thing you will encounter. This has a few objects in it that appear to be depth charges. They are drums about the size of a 20 litre drum and look similar to ones I have seen in Chuuk Lagoon and on Allied wrecks in the Solomon Islands. There are six holds on this wreck. The first one you come to is Hold 6. Like all the holds, it is quite open and easy to access. This hold is empty. You can swim through to Hold 5 and again this is empty. Outside there are masts and crane arms to see, as well as winches etc. Coming out of Hold 5 go out and over the deck to Hold 4. Once again, there is nothing in this hold. From here you can enter the superstructure of the ship. There are some baths in the first level on the starboard (upper) side forward near the bridge. In front of the bridge is Hold 3. This is empty as well, so there is probably no point in entering. Next to this hold there is some chain that runs over the deck and down the hull. It seemed to me that it was wrapped over one of the winches. I am not sure if this is the ship's own anchor chain, possibly it is and the winch was being used to pull the anchor in. 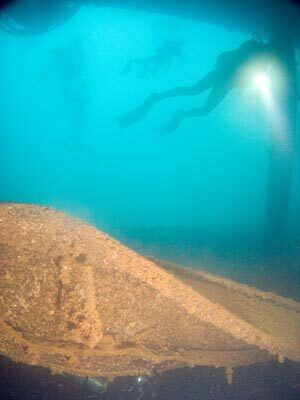 It is also possible that the chain is from the mooring buoy and has simply fallen back over the wreck once it sank. Adjacent to Hold 2 on the starboard side there is a spare anchor on the deck. I think that there is another one on the rear of the forecastle. The bow is damaged where a bomb hit the starboard side. Both anchors are out and the chain disappears down towards the sandy bottom. There is a gun platform at the bow. In fact, I seem to recall that perhaps there are two, one either side of the centreline. However, there is no gun. By now you will be well into decompression, so it is time to head back to the bridge. There does not appear to be any telegraph or helm. The funnel is intact. Any remaining time can be spent exploring the area of the bridge and underneath. As mentioned earlier, there are a few baths to be seen here. We did not go any deeper into the bridge as we did not have time. I am sure that there will be more to explore. Likewise, we did not have time to enter the engine room. 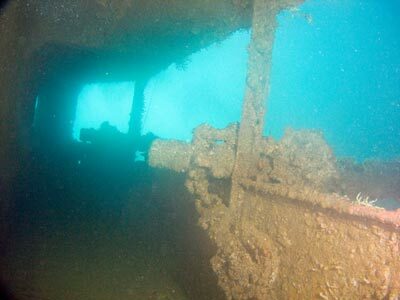 This wreck is a nice dive, but it has none of the artefacts on it that you find in the wrecks of Chuuk Lagoon. 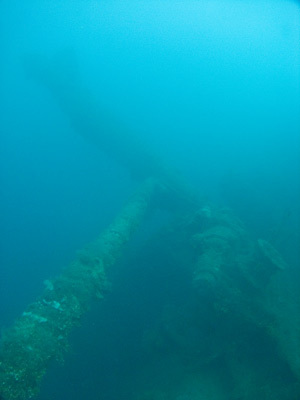 In fact, the worst Chuuk wreck is better than this wreck. 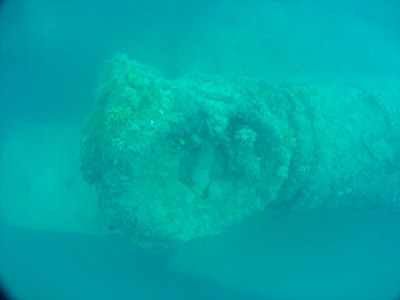 Likewise, the visibility is not as good as the best wrecks in Chuuk, but is similar to wrecks like the Hanakawa Maru and Heian Maru. The wreck is covered in a layer of silt which is easily disturbed, but again, apart from perhaps in the engine room this should never cause a problem. Visibility on our dive was about 10 to 12 metres. Temperature was about 29ºC. However, do not let any of the above put you off diving it if you are in Guam, it was an enjoyable dive.